In November 1852, the Parochial Board of Dundee agreed to set up a poorhouse for the parish and set up a special 10-man committee to pursue the matter. The adjoining parishes of Monifieth, Barry, Liff and Benvie were invited to combine resources for the construction and use of the building but all declined — Liff and Benvie doubted whether Dundee would "look after" their poor. In March 1853, a five-acre site was acquired from the Craigie Estates near Stobswell, at the west side of Mains Loan, on what is now Molison Street. In July 1853, following newspaper advertisements, five architects submitted plans and specifications for the Poorhouse and those of William Lambie Moffat of Edinburgh were chosen. The building was planned to house 800 paupers, 100 sick and 100 lunatics. On 10th January, 1855, the final version of plans were approved and local tradesmen were invited to tender for the work which commenced in June. The building was financed by a loan of £10,000 from the National Bank of Scotland repayable at 4% interest. Its location and layout are shown on the 1873 map below. The main building was an H-shaped structure, three stories in height. A separate block for sick and lunatic inmates stood to its north. 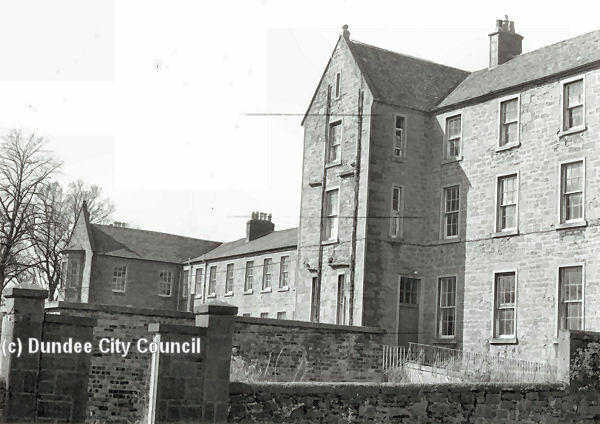 Former Dundee East poorhouse from the south (Molison Street), 1977. Former Dundee East poorhouse from the south (entrance driveway), 1977. On 26th August, 1856, Mr and Mrs Gunn were taken on as Governor and Matron of the Poorhouse. Mr Gunn, a former wines and spirits merchant, was paid a salary of £79 per annum, and his wife's £25, together with "the usual rations of the house". The first inmate was admitted to the poorhouse on 19th November, 1856. The Poorhouse is situated in an open and healthy part of the town at the back of Stobswell Feus. It is 210 feet long and 55 feet in width and is three storeys high. Airing yards are used to separate male and female inmates. Two acres of ground is available for inmates to supply vegetables for the Poorhouse. Various alterations are still in the making. When all arrangements have been completed the Poorhouse will be well suited for the purposes for which it was intended. 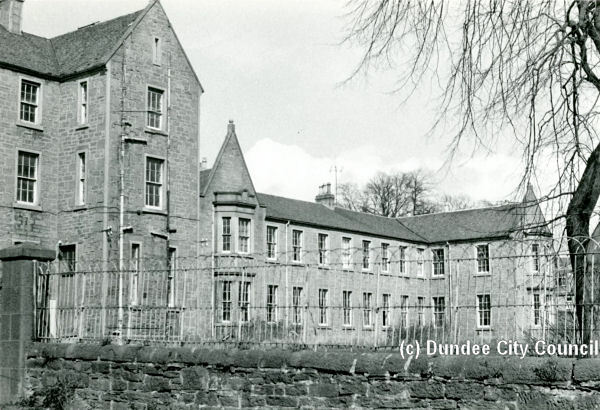 Former Dundee East poorhouse from the north, 1977. In 1879, Liff and Benvie had a change of heart and joined with Dundee to form the Dundee Combination. The Dundee poorhouse became the Combination's East Poorhouse, later known as the East House Poor Law Institution. In 1907, the Board of Supervision published extracts from the previous year's annual report by the poorhouse's governor, Mr J. Chisholm. All provisions when received at the Poorhouse are carefully examined to prevent any of the goods considered not up to the Contract Standard being accepted. The principal articles, such as butcher meat (prime ox), bread, milk, &c., are, 1 believe, invariably good. No article of diet which is not of good quality, or not in a wholesome state, is given to the inmates. The preparation of the food is carried out under the constant supervision of experienced officials. I have always felt distinctly averse to the severe punishment of Poorhouse children; firmness and persuasion, I believe, are of more effect and likely to produce better behaviour. This, probably, might also be said regarding most of the adult inmates. There are, of course, refractory persons always found in institutions in largo centres, and in dealing with such any punishment the Poorhouse Governor can inflict appears to me to have little effect. As in England, inmates who refuse to work should be handed over to be dealt with by the police authorities. The work provided for the male inmates consists principally of wood-chopping and bunching, rope-teasing, yarn-winding, and field labour. A number of inmates are also employed at their respective trades, such as joinering, painting, shoemaking, tailoring, or plumber work, and smith work. The most profitable works, financially, are firewood and rope-teasing, in which the ordinary inmates are chiefly engaged. In the year 1902, the sum of £33 was expended upon the tailoring of male inmates and boys' clothes made by outside contractors; while in 1903, the sum of £29 was similarly spent. Since then nothing has been paid for this work, which is how entirely done by the inmates and female officials. Children of school age — an average daily number of 60 — attend the public school, which, no doubt, helps to make their life and residence in the Poorhouse less monotonous. They seem brighter and happier than if they wore completely isolated and prevented from mixing with other children, many of whom possibly live with less comfort than those resident in the Poorhouse. In the evening, under the supervision of the officials, the scholars prepare their lessons, while once a week those of Protestant persuasion receive religious instructions from the Chaplain. The Roman Catholic children are similarly taught by their clergymen or "sisters," who visit the Institution regularly. On Sundays several of the older Protestant boys and girls are formed into a sort of choir, and, with the leader of praise, take part in the singing during divine service. After the service is over they are engaged for about half an hour with the precentor, who instructs them in the practice of singing. A few of the older girls are being taught fancy sewing work by ladies connected with the district Episcopal Church, who call once a week. The children are also being taught in the use of forks and knives at meals, and they are otherwise instructed in all that pertains to obedience and good discipline. The work provided for the male inmates consists chiefly of wood-splitting, and bunching, rope-teasing, yarn-winding, and field and garden work. Inmates possessing a knowledge of trade; such as masons, joiners, slaters, plumbers;, painters; shoemakers, tailors, &c., when able for work are usually, engaged at their respective trades; and thus, the cost of repairs is considerably reduced; under the supervision of the matron, the tailoring of all clothing' supplied to the inmates is being done by inmates' labour. The female inmates are principally employed at laundry work, ward-keeping, cleaning, sewing and mending, and household, duties. Usually less than one-half of the female ordinary inmates chargeable are able for any work, and we are, at times, severely pressed in keeping the demands from the various departments for female assistance up to the required standard.. Every inmate who is considered able for the smallest amount of work is kept doing something. A few Hospital patients and infirm inmates are engaged at work connected with the Brabazon Employment Scheme, which is carried on by a number, of ladies who visit in the forenoon of every Tuesday. The work taught includes rug and basket-making, wood-carving, fancy needlework, &c; This form of work has been the means of brightening the lives of those engaged in it, and also the lives of many of those around them, particularly the sick and infirm who are unable to take part in any of the ordinary work of the Institution. During the Second World War, 60 of its beds were taken over by the nearby Maryfield Hospital. In 1946, the establishment accommodated 454 inmates. It later became the Rowans old people's home before its demolition in 1977. 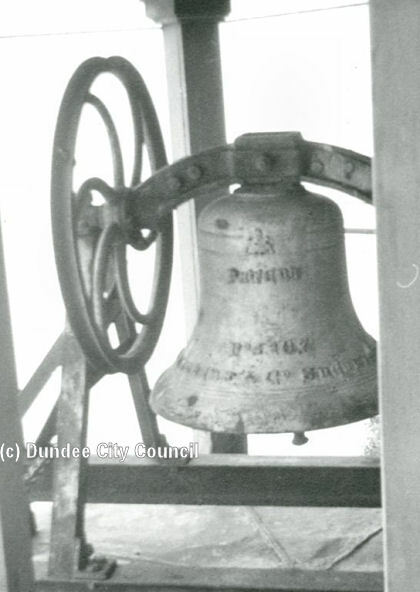 The former poorhouse bell which had marked the inmates' daily routine ended up in a local scrapyard. A parochial hospital, or hospital for the poor, was erected at the north of the East Poorhouse in 1893. It was a typical pavilion layout with a central administrative building, with two ward blocks for males at the west, and two for females at the east. 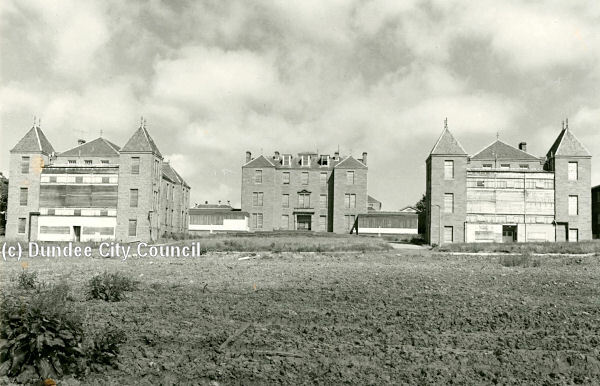 Dundee Poor Hospital from the south, c.1973. When the hospital was taken over by the local authority in 1929, it began to concentrate its efforts on maternity and child care. 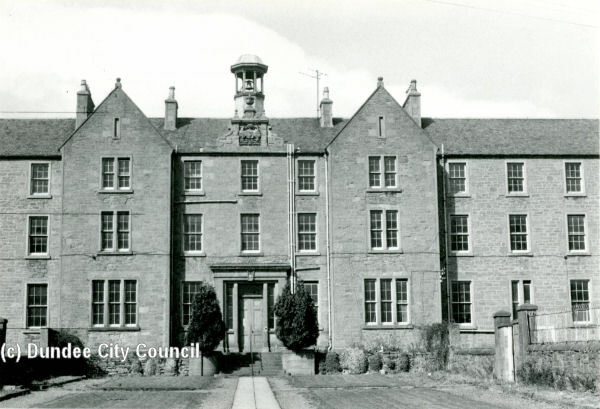 After 1948, it became know as Maryfield (Maternity) Hospital then later as Maryfield General Hospital. It closed when Ninewells Hospital was opened in 1972. The Liff & Benvie parish poorhouse was erected at the north side of Blackness Road and opened its doors on Tuesday 5th April 1864. Its construction cost £7,000 and it could accommodate up to 200 inmates. Male quarters were at the west of the site, and female at the east. Male and female lunatics were located at the far end of each section. The site location and layout are shown on the 1873 map below. By the late 19th Century, the West Poorhouse was mostly accommodating the elderly, infirm or insane while younger paupers were accommodated in the more spacious East Poorhouse. In 1887, to celebrate Queen Victoria's Golden Jubilee, the inmates of the East and West Poorhouse (approximately 720 and 280 inmates respectively) were given a substantial dinner of mince and potatoes, rhubarb tart and milk. The adults received either snuff or tobacco from Mr Baillie Hunter and Mr Sharp gave all inmates one shilling. In 1914, the West Poorhouse was taken over for military occupation and its occupants transferred to the East Poorhouse. 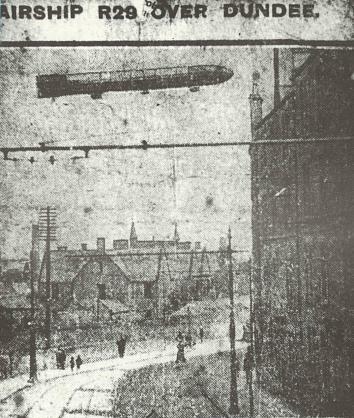 A striking photograph of the building from 1913 shows the R29 airship over the poorhouse. It was taken from the top of a tram on the Blackness Road. After the war, the West Poorhouse was taken over by Logie School, which later became Harris Academy Annexe. The old poorhouse building was demolished and replaced by a new building in around 1930. In 2000, the then unoccupied buildings were destroyed by a fire. The University of Dundee's Archive Service hold an interesting item: "an excerpt of minutes of special meeting of Poorhouse Committee of Dundee Combination Parochial Board, 1887, approving an application of the anatomical committee of Dundee as made by Dr [A. Melville] Paterson and Dr [Robert] Sinclair for the bodies of deceased persons." In about 1915, the Dundee Combination established a children's home at Ashcliffe House, Perth Road, Dundee. It could accommodate up to 80 children. In 1924, the home moved to larger premises at Duncarse house, 381 Perth Road. Dundee Parochial Board minutes (1848-95); Dundee Parish Council minutes (1895-1930). Dundee East Poorhouse: Register of inmates (1856-1908); Register of admissions and discharges (1928-56); Registers of staff (1865-1962); Register of accidents (1887-1919); Abstracts of weekly returns of admissions and discharges (1885-1961); Newscuttings (1926-34); Visitors' book (1893-1973); Register of bedding and clothing (1902-1973); Hospital patients book (1907-09). Liff and Benvie Parochial Board: Minutes (1869-83); Register of poor (1854-65). Archive Services, University of Dundee, Dundee DD1 4HN. Maryfield Hospital: Admissions (1929-71); Daily statement of admissions (1945-71); Indexes of admissions (1958-76); Intensive care unit admissions (1967-74); Casualty admissions (1968-69); Discharges (1949-58); Births (1938-68); Theatre operations (1950-74); Out-patients (1957-60); Indexes to registers (1937-58).